No more stumbling around in the dark if you have the LifeMax Portable LED Night Light with a movement and light sensor. It turns on a low powered LED light when movement is detected. Ideal for lighting areas where no mains power is available such as cupboards, sheds, garage, dark passageways. The light detects motion and lights automatically in the dark. It can be wall mounted or can be free standing this offers fantastic flexibility. It is ideal for a disabled person wanting a portable night light to help find a light switch. 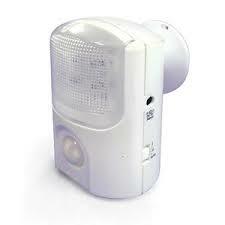 The light comes on as soon as motion is detected and turns off 1 minute after movement stops. The light switch might be a few yards along the landing from the door, use the NED light like a torch. The portable LED night light is great for lighting in areas where no mains power is available such as cupboards, sheds, garage, etc. Both Infra-Red and Photo Sensor technology detects motion and lights automatically in the dark. There might be a dark passageway that needs to be negotiated. A gate that has to be opened or shut. Think of uses in the in the home, workshop, office or garage and many security applications – turns on when movement is detected in the dark. The Lifemax Portable LED Night Light is very useful. Both Infra-Red and Photo Sensor technology detects motion and lights automatically in the dark. This Light was purchased to aid someone disabled to get out of bed and reach the toilet and return, without disturbing anyone else, this is now in constant use. there are pretty smart solutions out there for all of us, and this turned out to be definitely the best I have found so far. Buy a Portable LED Night Light with a movement and a light sensor now.